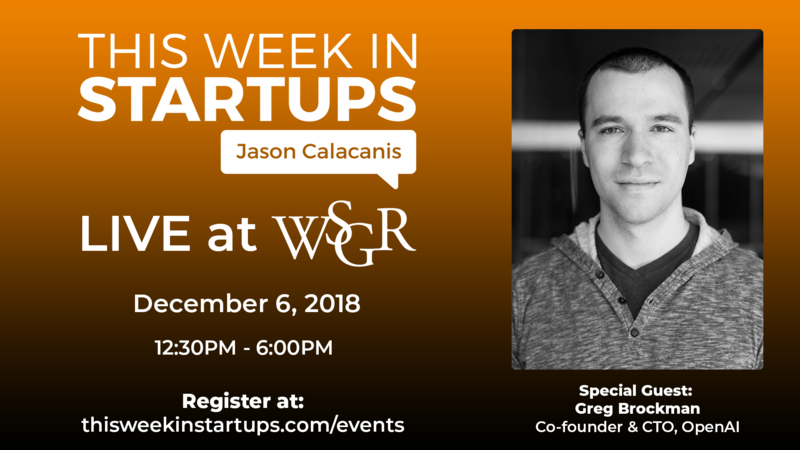 this week in startups live! Speaker: Sam Liang, CEO & Co-founder of Otter A.I. Jason Calacanis is a technology entrepreneur, angel investor, and the host of the popular podcasts This Week in Startups and Angel. As a “scout” for top Silicon Valley venture capital firm Sequoia Capital and later as an angel investor, Jason has invested in 150+ early-stage startups including 6 “unicorns” (billion-dollar valuations). His book “Angel: How to Invest in Technology Startups: Timeless Advice from an Angel Investor Who Turned $100,000 into $100,000,000″ was published by Harper Collins in July 2017. Greg Brockman is co-founder and CTO of OpenAI, a research company attempting to build artificial general intelligence which benefits all of humanity — or help a value-aligned group do so instead. He is one of the co-creators of projects such OpenAI Five, the world’s first AI competitive with professional esports players. He was previously the CTO of Stripe, which he helped build from 4 to 250 employees. Gregs studied mathematics at Harvard and computer science at MIT but dropped out of both. Sam Liang is the CEO and Co-Founder of Otter.ai. Otter.ai created Ambient Voice Intelligence™ technologies with deep learning that understands human-to-human conversations, and won the Best Apps of 2018 Awards by Google and Mashable. Previously, Sam was the CEO and Co-Founder of Alohar Mobile Inc., later acquired by Alibaba. Sam was also the lead of Google Map Location Platform & API for four years. Thank you to WSGR for hosting the event. want episodes directly sent to your inbox?